Handbells are commonly known as an instrument played by a group. English handbells were developed starting in 1692 as a tool for tower bell ringers to practice their “changes” (complex patterns played to show off how many bells a tower holds). With the development of more finely tuned handbells, tune ringing became extremely popular in England. Solo ringing dates back at least to Victorian times and the vaudeville stage. It is increasing in popularity but still relatively rare because of the shortage of teachers and repertoire, as well as the significant investment of time, money, and space required to own, play, and transport the instrument. A question often asked by audience members: How does the soloist know which bell is which? Each bell is a single pitch, like a piano key, and is labeled on the handle. The smaller the bell, the higher the pitch. The starting point for each piece is keyboard order, with some bells strategically displaced from that order depending on where they’re needed. Another common question is why, when two bells are in one hand, sometimes you hear one bell, sometimes the other, and sometimes both. One distinguishing characteristic of an English handbell, compared to other small handheld bells like a school bell, is that the clapper moves in only one plane (back and forth), not in every direction. The soloist picks up two bells with the clappers perpendicular, then rotates her hand so each clapper will strike at the right time. At a certain angle, both will strike. This technique is called four-in-hand: the bells are held “in hand” (rather than rung directly from the table), and there are two bells in each hand, for a total of four. 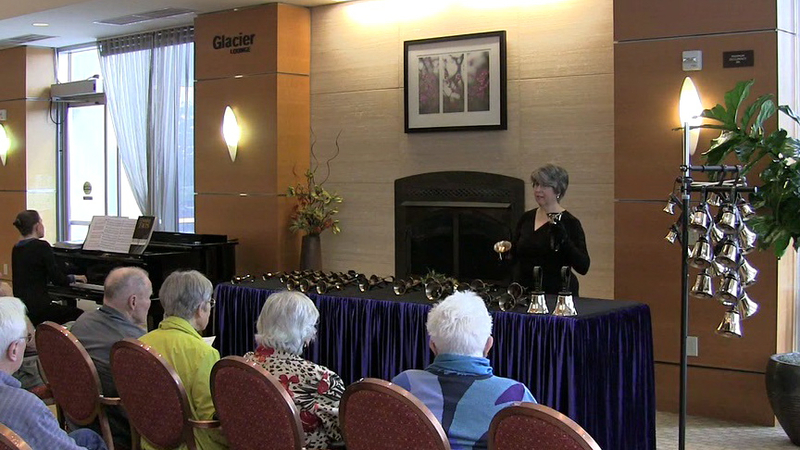 Solo handbells are a relatively new instrument, with extremely limited secular repertoire. Nancy usually performed pieces adapted from other solo instruments or voice, as well as works written especially for her.